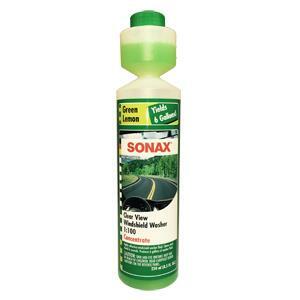 SONAX Clear View Concentrate is a highly concentrated cleaning additive for the windshield washer unit. One bottle of the concentrate yields over 6 gallons of cleaning fluid. Removes insects, oil, grime, silicone and dangerous dazzling films without streaks. Ideal for high quality XENON headlamps and light diffusing plastic headlamps in clear-lass optic. Fresh fragrance. Comes in a practical bottle with dosing chamber. Phosphate-free.